Getting into single-family rental (SFR) investing can seem like a hefty undertaking if you’ve never done it before. Each step comes with its own set of questions. How much money do you need to actually get started? Where should you begin your search? How do you determine which property is the best investment option for you? To simplify the whole process, we’ve broken out the main components of a holistic SFR investment strategy, and pulled together our top tips for every stage. If you plan on using financing (like the majority of buyers), know that lenders are more conservative when it comes to financing investment properties compared to financing your own home. Most require at least 20% down, and that rate typically increases as you expand your portfolio. Closing costs. If you're using financing, this generally falls in the range of 3-5% of the purchase price. Some lenders require at least six months of mortgage payments in reserve to cover any unexpected vacancies or emergency repairs. Tip: To see how much you’ll need for your down payment, check out any of the listings on Roofstock.com. For every listing, we provide the “initial investment” figure, which is the estimated amount of capital needed to purchase the property. This amount includes your down payment, loan & acquisition fees, closing costs and immediate repair costs. If the numbers look daunting, don’t be discouraged. Our article on how to save for a down payment on an investment property can help you get there. You can still find great investment properties for under $100K, which means your down payment could be $20,000 or less. For tips on how to prepare for the loan application process, check out our investment property financing cheat sheet. Disclaimer: Some buyers first decide which market they want to invest in, then drill down. Others focus on finding a property with the right qualities, and then back-check the market to make sure it’s healthy. It’s a bit of a chicken-and-egg situation — either order works. (Consider steps #2 and #3 in this article interchangeable). Watch for emerging markets. To spot an up-and-coming real estate market, look for an increase in existing home sales, rising rental rates, strong population growth, and economic/business growth. Follow the corporate money. Are major corporations investing in new offices or factories in the area? Real estate markets attracting big-name companies may be primed to experience a boom in rental demand and an increase in overall property values. Pay attention to corporate announcements, press releases, and areas where major corporations are setting up shop or opening up a second headquarters. Research the top single-family rental markets. Find out where the top single-family rental markets are according to the experts. ATTOM Data Solutions, RCLCO, National Real Estate Investor, John Burns Real Estate Consulting, CoreLogic, and the National Rental Home Council are all credible sources, to name a few. For a list of strong SFR markets with available inventory, check out Roofstock’s coverage area or explore our market pages. Examine specific zip codes. All big cities have great and not-so-great places to invest. ATTOM Data Solutions' reports and Zillow’s home values tool can help you get more granular. You can also seek out intel from locals on BiggerPockets’ forums or speak directly with a Roofstock advisor for deeper market insight. Evaluate the neighborhood. Think about attributes that appeal to tenants. This includes local school quality, the walkability factor, trees, nearby amenities (parks, retail shops, restaurants, general services) and commuting distance to city centers and/or major transportation hubs such as airports and subway stations. You can also take advantage of the Roofstock Neighborhood Rating, a first-of-its-kind index that helps buyers measure investment risk against potential return. Picking the right property is all about finding one that aligns with your investment goals, strategy and style. Are you comfortable investing in a riskier property if it means higher cash flow? Or would you to prefer to own a rental home with moderate cash flow and less risk? (For example, a newer home, better location, higher likelihood of tenant stability, etc.) When it comes to selecting the best property for you, here are some key factors to evaluate. To estimate how much rent you’ll be able to charge, head to RentCafe, Zillow, Apartments.com or Craigslist and peruse typical rates in your target market. You can also view the current rent and market rent — as well as the estimated first year net cash flow — for properties on the Roofstock marketplace. Many investors also look for properties where the monthly rent is equal to or greater than one percent of the home’s purchase price, aka the one percent rule. This isn’t a make-or-break-it benchmark for everyone, but it can be a useful screening tool. If you’re looking to play a longer-term investment strategy, the buy-and-hold method may be right for you. Investors using this strategy may be OK with a negative or break-even monthly cash flow on a property without hesitation. This is because their expected ROI will derive from the increase in property value. Consider avoiding overly inflamed markets, like Seattle, WA and the San Francisco Bay Area, where high appreciation rates come with exorbitant purchase prices. Explore real estate markets in the Midwest and South. When drilling down into a specific area, try to identify pockets of potential appreciation before they pop. Keep an eye out for new retail developments, railway expansions, offices, and other upcoming construction. Compare home sales from 12 months ago, nine months ago, and then six months ago to spot upswings in housing demand ahead of the curve. A few examples of good markets for a buy-and-hold strategy include Orlando or Tampa, FL; Phoenix, AZ; Las Vegas, NV; and the Dallas, TX metro area. All of these cities provide a reasonable balance between the upfront cost of the investment and projected appreciation. Age: Older properties may require a little more tender loving care than like-new properties, so you may want to set aside a little more each month to be prepared. Alternatively, if you’re buying the newest/nicest/most expensive house on the block, that could also be a problem when it comes to return on investment. You can’t control how the neighborhood evolves, how your neighbors keep their property, the school quality, etc. Needed repairs next time the property turns: It’s important to know about any deferred maintenance or repairs that will need to be addressed next time the property turns. Tip: Roofstock provides this estimate with every property listing on its marketplace. Other estimated repairs coming up in the next 5-10 years: When reviewing the inspection report, look at big-ticket items such as the roof and HVAC system. What kind of condition are they in? When will they need to be replaced? Is the structure of the roof appropriate for the type of weather in that area? Check to make sure no horizontal cracks were identified in the foundation. Curb appeal: While the quality and comfort of the interior is the most important, curb appeal can’t hurt when it comes to attracting renters. Bear in mind, you can always make aesthetic improvements to the exterior down the road. Home characteristics: Buying a rental property is different than buying a primary residence. It’s necessary to remove the emotional and personal bias to some extent, but it doesn’t hurt to ask yourself, “Is the property I’m buying going to be desirable to some set of tenants?" 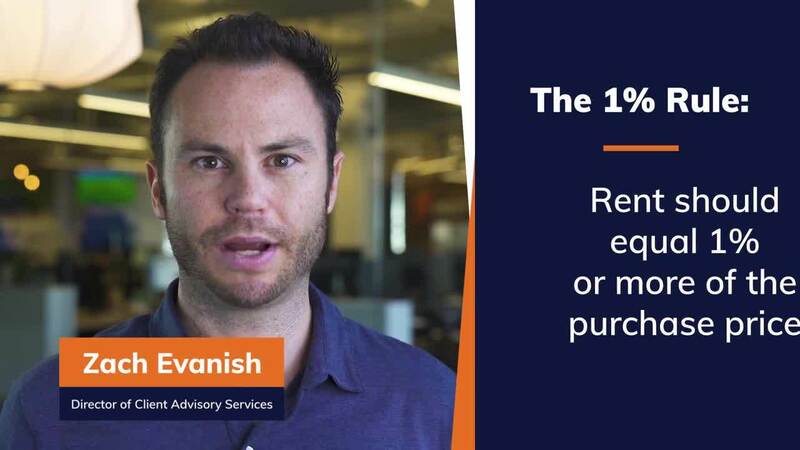 Take note of attributes that impact desirability and potential resale value. This includes the number of beds and bathrooms, layout and functionality, air conditioning, parking space and storage space. Where can you find properties? You can shop for properties online on real estate listing sites such as Zillow, Trulia and Redfin, and then complete the purchase with the help of a realtor. 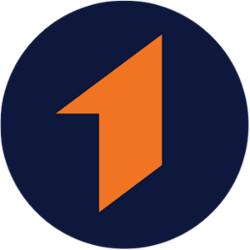 For a streamlined, one-stop-shop experience, Roofstock has everything you need to find, evaluate, purchase and own SFR investment properties — 100% online. Bonus: All Roofstock listings have tenants in place or come with guaranteed rent. If you buy a property near where you live, you may want to manage it yourself. However, a landlord's responsibilities — handling repairs, collecting rent, screening tenants — can be very time consuming. Not to mention, if you don’t have landlord experience, you may inadvertently mishandle some of the more technical parts of property management, such as tenant background checks or proper eviction procedures. To avoid the day-to-day stress of being a landlord, many investors end up hiring a property management company. If you’re investing remotely, hiring a property management company is essential. Rates run in the ballpark of 8-10% of the total rent depending on the market, but a good property management company is well worth it (and can even save you money in the long run). 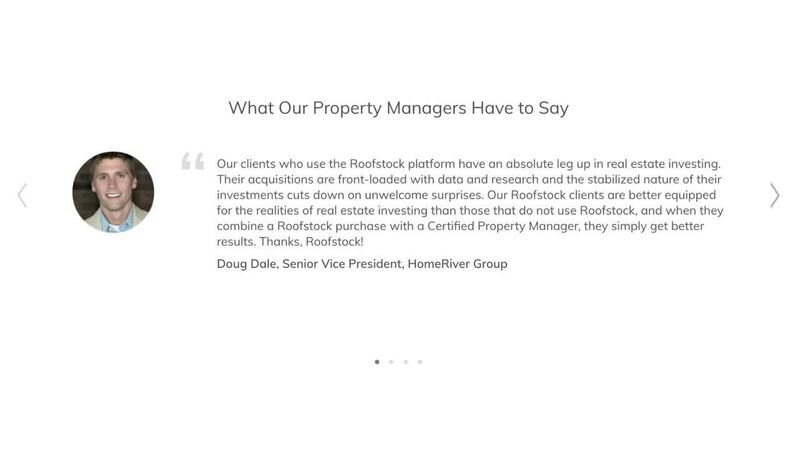 Bonus: When you purchase an investment property on Roofstock, we set you up with a vetted local property manager who cares for your investment. What does a property manager do for you? When should you hire a property management company? Property management company: As we discussed above, a property manager will take care of the day-to-day duties of being a landlord. Accountant: An accountant with real estate expertise will maximize your investment-related tax breaks and save you plenty of headaches come tax time. Accounting software or app: Throw out that shoebox full of receipts and start tracking your expenses with an app or software. Trust us — your accountant will thank you. Lender: A lender who specializes in single-family rental homes can help you figure out the right mix of terms, advantages, and costs to suit your investment goals. Insurance agent: This person can guide you toward the appropriate types of coverage you’ll need to safeguard your investment and advocate for you in the event of a claim. Real estate attorney: Real estate law is complex. Some investors, especially those with larger portfolios, employ an attorney to ensure every document and transaction is airtight. Someone to help you find the right properties: A local realtor can show you homes in your area, or you can find investment properties in strong rental markets throughout the U.S. on Roofstock. Big gains or continued losses are also common reasons to sell. Depending on what you paid for your property, cashing out after the house has appreciated by 10-20% could equal substantial profits. On the opposite end of the spectrum, if your rental property is losing money monthly, it might be time to cut it loose and reinvest somewhere else. No matter what’s driving your decision, real estate investing provides reasonable fluidity to get in and out as you need. >>Related: When is it time to sell your rental property? Come tax time, you’ll want to make sure you are maximizing all of the breaks afforded to businesses and real estate investors specifically. This includes mileage/airfare, home office deductions, repairs/maintenance, and property management fees. If you buy and sell an investment property within a 365-day period, you are subject to claim any money you make on that property as income. If you hold a property for over 365 days before selling, you are taxed a 0%, 15% or 20% rate depending on your tax bracket. You can write off any professional services, such as accountants and lawyers, as business expenses. Deciding on a clear investment strategy is important, but eventually you will have to test the real estate waters for yourself. Every investment property will have its own nuances, and your personal situation and style will dictate which strategies you decide to implement. Try to manage your expectations, learn from experience and have some fun as you grow your real estate portfolio. Written by the Roofstock marketing team. Stay in the loop on industry trends and best practices. Get tips & insights delivered straight to your inbox. Get industry insight and expert tips. #1 ranking based on website traffic from Alexa.com as of 7/31/18. Over $1 billion in transactions since 1/26/16 as of 1/1/18.